It’s generally the case that works of art are centered on action, and the surrounding space, however interesting it may be, is in a supporting capacity. Sometimes, though, the subject is the space itself. The focus is not so much on people and objects as on the space where they occur. 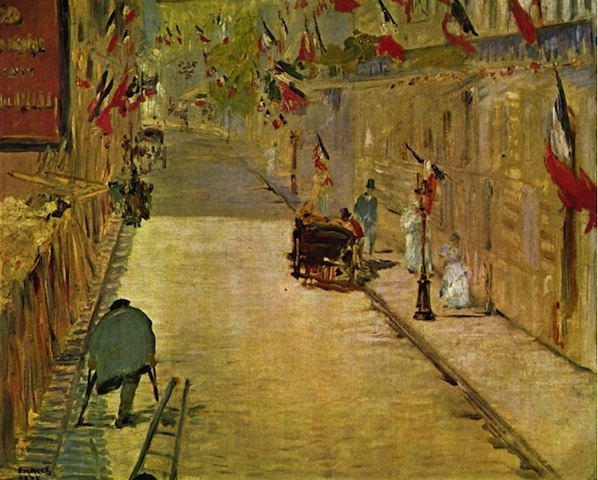 Manet’s “Rue Mosnier”, for example, is full of active elements, but they don’t jump out at you. To get the piece you have to look around and discover the details–the building fronts, the flags, the figures here and there, the carriage, the light at the end of the block, hinting at the next street. The subject here is the whole scene. 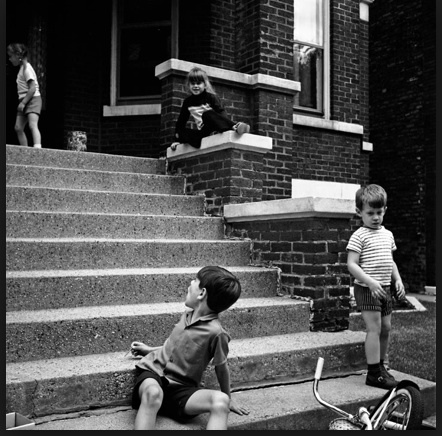 In Maier’s photograph the kids are lively and interesting, but the subject is the environment that the kids inhabit–the concrete steps, the bricks, the blockyness of the space. 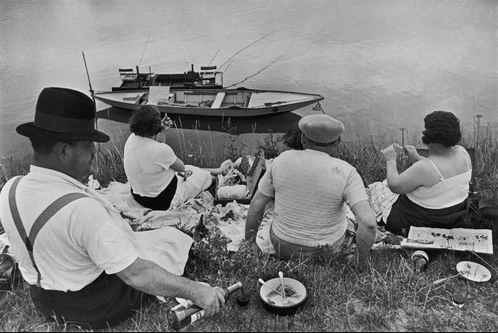 In Cartier-Bresson’s photo it’s the falling ground–like Maier’s photo seen from above. These pieces are so engaging because they aren’t formal representations of action drawn up for us to study and admire; they are spaces such as we see in our own lives, with significant bits here and there if only we make the effort to notice and appreciate them.